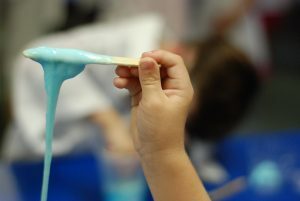 This recipe makes cool, non-toxic slime that appears to have a life of its own! It’s electroactive slime, so it reacts when it’s close to electrically charged objects. Rub a piece of polystyrene foam or a balloon on your hair or a wall to charge it and observe how the slime reacts. Mix the cornstarch and vegetable oil together in the glass. Refrigerate the slime mixture until it is chilled. Remove from the refrigerator and stir (separation is normal). Allow the mixture to warm enough so that it can flow. Take a block of styrofoam and charge it by rubbing it on hair, wool, or a cat. Tip the container of slime (which should flow slowly). Place the charged styrofoam about an inch (2 cm) from the flowing slime. It should stop flowing and seem to gel! If you wiggle the charged styrofoam the slime may follow or pieces of it may even break off. When the styrofoam is removed the slime will continue to flow. After use, refrigerate slime in a sealed container. Be sure to try other slime recipes, too!